“But we want to win, triumph, beat the other team. Be the best!” says Juan. Corty replies, “Winning is about finding the right answers, and you can probably do that faster together. We’ll talk about that later. 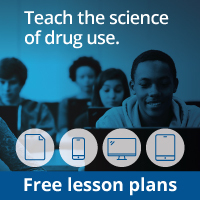 For now, we’re going to learn about drugs. “Well, drugs are categorized into classes, and one of the classes is stimulants,” says Corty. Corty says, “Can you come up with one other?” The kids think for a moment but shake their heads. “Ritalin is a prescription drug that’s also a stimulant. Do you know what stimulants do?” asks Corty. “Whoa! That can’t be good for you,” Juan comments. “It isn’t! Your mission is to make a chart that lists each stimulant,” says Corty. “That sounds like a great way to learn about stimulants. We can write down all the different stimulants, record the different names they have, how they’re used, and the effects on the body, the brain, and neurotransmission,” Juan suggests. “But first, to help out, I’m going to show you a PET scan,” says Corty. “Oh, that’s like when we took my dog to the vet to have x-rays. He ate one of my dad’s slippers,” Juan says, as Beth giggles. Corty says, “No. PET stands for Positron Emission Tomography.” Corty leads them over to the computer and “wakes it up,” using the mouse. Two PET scans appear, one showing the normal brain and the other the brain on stimulants. “All you need to know is that these PET scans show a normal brain and a brain affected by stimulants.” The kids see how the PET scan affected by stimulants shows less activity than the PET scan of a normal brain. The kids move away from the computer, and Juan says, “Let’s get started on those charts.” The kids gather their materials together and start working on the charts. Corty leaves while they are working. Stop here until students have completed #5 in the procedure. As the kids are finishing up, Corty jogs in holding a steaming cup of coffee. He sips the coffee. He gradually gets more hyper and jogs in place. Corty begins talking very fast, “That’s a very nice chart. Very impressive! Are you almost done? You do know a lot about stimulants. Tell me everything you know about stimulants.” Corty starts doing jumping jacks. Juan and Beth look at each other, at Corty, then at the cup of coffee he’s now set aside. “And that brings me to a question we had: If drugs are so bad for you, then why do people keep on taking them?” asks Beth.